Sustainably designed federal buildings, such as the U.S. Courthouse in Seattle, cost 19 percent less to maintain on average, according to a new PNNL report. Photo courtesy of U.S. District Court. WASHINGTON — In addition to emitting less carbon dioxide and using less water, sustainably designed federal buildings cost 19 percent less to maintain, according to a report by the Department of Energy's Pacific Northwest National Laboratory. The results are included in a white paper recently released by the Government Services Administration, or GSA. Have more satisfied occupants, by 27 percent. "To measure green building performance you must look at the building holistically, which includes the occupants and maintenance impacts in addition to the commonly targeted energy and water use," said Kim Fowler, a senior research engineer and buildings relationship manager at PNNL, who is lead author of the paper. "One can design and construct a building well, with the greenest of specifications, but if it's not operated well or isn't meeting the needs of the occupants, the grandest intents go out the operable window," she said. The PNNL team conducted the analysis in seven of GSA's national administrative regions to evaluate how well its sustainably designed buildings are performing in comparison to average commercial buildings and to GSA's baseline measurements of its sustainably constructed buildings. Researchers worked with building contacts to collect data from utility bills about energy and water use, maintenance and operations costs, and waste and recycling costs. They also conducted a survey to glean information about occupant commute and satisfaction. They then compared those results to national averages. 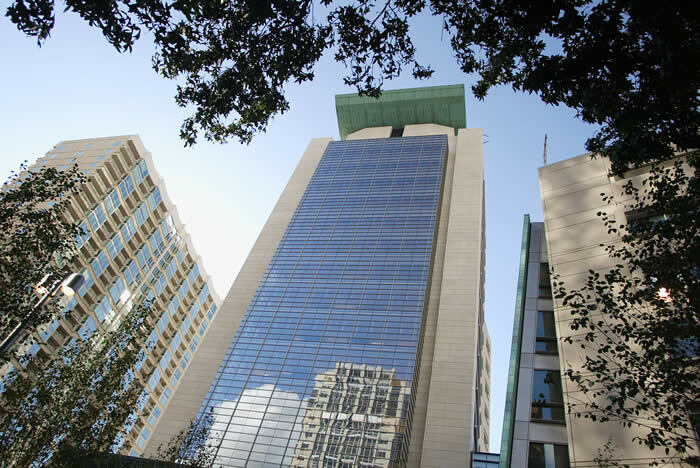 One of the buildings evaluated is the United States Courthouse in downtown Seattle. The courthouse has been deemed one of the safest structures ever built. In 2004 the courthouse won GSA's award for construction excellence. It features radiant floor heating, high efficient lighting, an energy management system, natural gas boiler and waterless urinals. PNNL's analysis found that, despite a slightly higher janitorial cost, the U.S. Courthouse's operating costs are 35 percent lower than the industry baseline. PNNL has conducted similar evaluations on more than 50 federal buildings over the past five years for GSA, the Department of Energy, Army, Navy and soon the Air Force. To read more visit the GSA's blog. Census Bureau Office Complex, Suitland, Md. SAMHSA Metropolitan Service Center, Rockville, Md. Rush H. Limbaugh U.S. Courthouse, Cape Girardeau, Mo. Carl T. Curtis NPS Midwest Regional Headquarters, Omaha, Neb. DHS Citizenship & Immigration Services, Omaha, Neb. DOT Colorado Field Office, Lakewood, Colo.
Auburn SSA Teleservice Center, Auburn, Wash.
Wayne L. Morse U.S. Courthouse, Eugene, Ore.
John J. Duncan Federal Building, Knoxville, Tenn.
Chas E. Bennett Federal Building, Jacksonville, Fla.
James H. Quillen U.S. Courthouse, Greeneville, N.C.
Robert E. Coyle U.S. Courthouse and Federal Building, Fresno, Calif.
Santa Ana Federal Building, Santa Ana, Calif.